I remember being thrilled when I captured this shot in 2009 on my first visit to Corkscrew Swamp Sanctuary. I just happened to turn around while descending the stairs from a platform overlooking a grasslands, and there he was — bird perched on a branch just a few feet away. Luckily, camera was ready and at hand! Now, thanks to my new book, Birds of Florida (by Pranty, Radamaker, and Kennedy, Lone Pine Publishing, 2006), I’m just as thrilled that I know what kind of bird this is. He’s not a warbler, as originally thought, but a Blue-headed vireo. 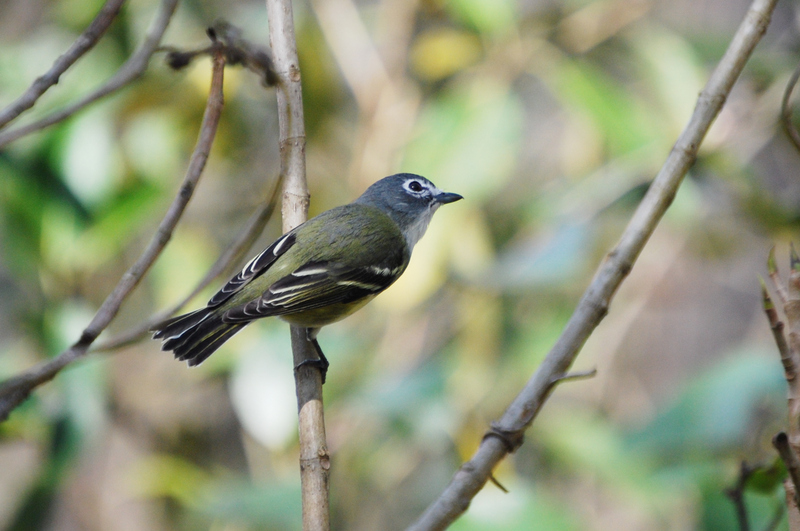 This entry was posted in Photos and tagged Blue-headed vireo, Corkscrew Swamp Sanctuary. Bookmark the permalink. birds of a feather ;o)….hope all is going well, Tim….we miss you! Thanks David. Settling in and doing well here — but also miss you and all my DC friends. Paul and I are enjoying visiting all the state parks and other nature places in the area.